Teaching Areas: Computer Programming, Integrated Project. Research Interests: Computational Intelligence, Intelligent Control. Address: Room CD633, Department of Electronic and Information Engineering, Hong Kong Polytechnic University, Hung Hom, Kowloon, Hong Kong. 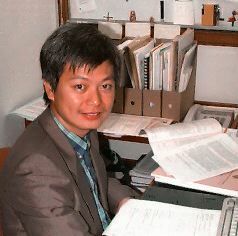 Frank H.F. Leung received his BEng degree and PhD degree in Electronic Engineering from the Hong Kong Polytechnic University (formerly Hong Kong Polytechnic) in 1988 and 1992 respectively. He got his industry-based training experience on PABX and telephone systems, and joined EIE, PolyU in 1992. Being an active researcher, he has published over 190 research papers and one book on Computational Intelligence, Intelligent Control and Power Electronics. At present, he is involved in the R&D on Home Automation and Robots. He has served as reviewer and guest editor for many international journals, and helped the organization of many international conferences. Currently, he is Executive Committee member of the IEEE Hong Kong Chapter of Signal Processing. He is Leader of the BSc in IMT programme and EIE Robotics Club. He is a Chartered Engineer, a corporate member of IET and HKIE, and a senior member of IEEE. He was recipient of the Sir Edward Youde Memorial Fellowship in 1989 and 1990. He likes hiking and badminton, and was certified for diving in open water by PADI.